New Baby Banana Baby Sharky Brush is bendable and is made of 100% medical grade solid silicone. This brush includes infant teether and toddler training toothbrush in one. 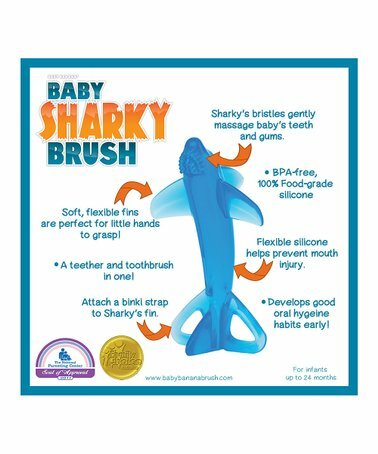 Baby Banana Baby Sharky Brush can be used by infants up to 24 months. 100% medical grade solid silicone makes the brush soft, safe, and flexible. Open loops in tail fin are perfect for attaching a binky strap (not included). Easy to grasp in numerous places for easy teething. Gently massages teeth and gums. Develops good oral hygiene habits early. Meets all product safety requirements as stipulated by CPSIA for phthalates and lead. FDA registered 300-6124900. Dishwasher safe for sanitizing. Freezer safe. The brush measures 4 ½ " x 2" x 1 ½ ".